The University of Nebraska Tractor Test Laboratory (NTTL) is the officially designated tractor testing station for the United States and tests tractors according to the Organization for Economic Co-operation and Development (OECD) codes OECD codes. Tractors are tested in the country of manufacture. Twenty-nine countries adhere to the tractor test codes (including non-OECD members: China, India, the Russian Federation, and Serbia) with active tractor test stations in approximately 25 of those countries. Reciprocity agreements with the codes require that once an OECD test report is officially approved, it must be accepted by all participating countries. NTTL employs 25-30 part-time student workers, most majoring in Agricultural Engineering or Mechanized Systems Management through UNL's Biological Systems Engineering Department. Many of these students are also members of the Quarter Scale Tractor Team, which competes in an annual event sponsored by the American Society of Agricultural and Biological Engineers. 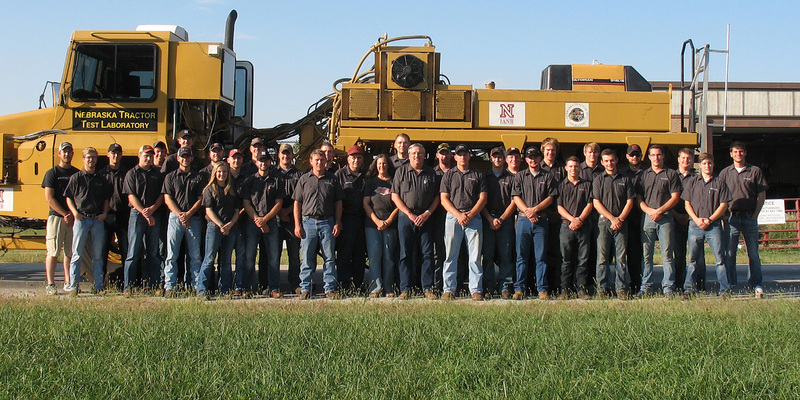 Nebraska Tractor Test Lab group photo, including Dr. Hasan Silleli (under "Test"). The Nebraska Tractor Test Laboratory seasons are spring and fall. The temperature outdoors must be between 40 and 80 for drawbar testing on the track. For the PTO testing on our dynamometer, we must target 73.5, in occordance with the requirement of the OECD Code 2 performance test. The Nebraska Tractor Test Laboratory test car was built in 2002 by Caterpillar, Inc. and was used in the testing of 18 tractors during our past Spring test season and 19 tractors during the Fall test season, bringing our total to 2,053 tractors tested since 1920. Built in 1919, to satisfy the needs of the Nebraska Tractor Law, our original building was designated as an historic site by the American Society of Agricultural Engineers. It now houses the Larsen Tractor Test & Power Museum. Sampson Retired after 45 years & 45% of NTTL Testing? Brent Sampson began work at UNL, May 1972 for Dr. Tom Thompson at Rogers Memorial Resarch Farm. In Jan. 1976, he began working at the Test Lab with Dr. Lou Leviticus. His first test was #1201, the Ford 5600, and by the time he retired, he'd tested 979 tractors, which represents 45% of the tractors tested since the first test in 1920. Collegues, NTTL workers, manufacturer representatives, and friends joined in a celebration for his retirement at the end of June. Two weeks later, Sampson returned to his work at the Nebraska Tractor Test Laboratory on a part-time basis. He continues to summarize test reports from other OECD stations and produce the annual summary booklet, enjoying the work of retirement. He is also a member of the Friends of Larsen Tractor Test & Power Museum board. Please be patient as we update our site. You should be able to easily access the "Test Report," "Permits," and "Test Board Actions." If you are not using Firefox as your browser to search, and you have trouble opening an item on our site, please try using Firefox. In the past, we have found that other browsers are inconsistent in opening our reports. However, in the most recent version of Firefox, you may find a few letters or numbers are dropped off the report; if you find that to be the case, at the top of the test report page are instructions to open in another reader or you may utilize another search engine to get the complete report.